A Grand-SlamTM secondary crusher, cage mill and Mega-SlamTM size reduction impact crusher from Stedman replaced three hammer mills at Brampton Brick Limited for clay processing. These size reduction impact crushers help produce a consistent, quality product. Brampton Brick Limited (Brampton, Ontario) is a completely automated, plant that occupies 400,000 sq ft and operates 24 hours a day, seven days a week. The company manufactures 300 million MBE’s (modular brick equivalent) annually. Brampton Brick products are used for residential construction and institutional, commercial, and industrial building projects. 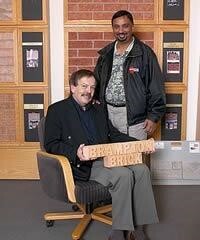 Photo, David Brown, (seated) Brampton Brick corporate engineer, and Ziggy Pabla, plant manager, shown in the company’s show room, proudly display the Brampton Brick sign. Started in 1871 by James Packham, Brampton Brick was originally known as Packham Brick Works. At the turn of the 20th century, Packham produced 2 million brick a year. The company changed its name to Brampton Pressed Brick Company Limited in 1905. In 1949, the company was sold to families that still control the company today and its name was changed to Brampton Brick Limited. Brampton Brick produced 6 million brick per year during the 1950s. In 1960, Brampton Brick replaced the pressed brick equipment with extrusion technology and allowed the company to increase production to 26 million brick per year. The company recently invested $2 million to retrofit its two original facilities. 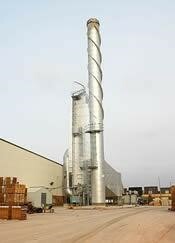 Two large scrubbers were replaced to take care of the hydrogen fluoride emissions. The company charts the scrubbers’ performance daily and the scrubbers are maintained properly to ensure they are operating efficiently. An environmental consultant monitors this process, as well as noise and dust abatement standards. At Brampton Brick, the brick making process is completely automated. The company’s employees monitor the process to ensure the production of a high quality brick. Annually, the company processes 600,000 tons of clay into powder. The clay is then blended and fed into a vacuum chamber that extracts the air. From there the mixture is extruded into long columns, the length and width of the finished brick. The raw brick column is wire-cut into individual bricks. Photo, Brampton Brick installed one of the largest dry limestone scrubbers in the world to retrofit two of its original facilities. The company invested 2 million (Canadian dollars) in the project. The scrubbers take care of hydrogen fluoride emissions and ensure that Brampton Brick meets and exceeds environmental standards including particulates. After the cutting process, the brick travel on computer controlled kiln cars to the dryer, which uses recycled heat from the kilns. Bricks are then fired in one of Brampton Brick’s three football-field sized, energy-efficient kilns at temperatures of nearly 1,080 degrees Celsius. The company burns the brick from the top and bottom, not the sides. “This firing pattern ensures a superior brick and guarantees the brick’s strength and durability,” Brown said. Computer controlled kiln cars deliver the finished brick for the final step in the automated process, packaging for delivery. The company tests shale from the quarry to determine its ideal firing range. During the brick making process, the ultrasonic pulse velocity of the brick is measured. A computer also measures the strength of the green brick material. A softer or harder size changes the end product. Ziggy Pabla, Brampton Brick plant manger, wants the material to be consistent with extruder parameters. Pabla started in the brick business in 1977 and monitors the processes to ensure a high quality product. An online device checks various process parameters. The moisture content is also checked. Brampton Brick also puts the final product through several additional tests: water absorbency after sitting in water for one minute, as well as tests for freeze/thaw durability. Another important aspect of being successful in the 21st century for Brampton Brick is their employees. “Our employees are our strength. They contribute to our success. We have 107 employees. On average, they have 10 to 15 years experience. They are one of the key factors in producing quality brick. You cannot replace experience as a factor in producing a quality product,” Brown said. If there is an issue with quality, Brampton Brick has procedures for equipment operators to monitor the processes and solve the challenge. Employees can suggest modifying the machinery, the process, or whatever it takes. The company‘s management and production staff work well together to learn how to use their new and existing equipment better. Photo, Purchased in February 1999, the Stedman Grand-SlamTM 4860 impact crusher replaced two, 80 to 90 T Verdes high maintenance hammer mills. The Grand-SlamTM grinds about 110 TPH of material. Maintenance costs went down 80% after Brampton Brick installed the Grand-SlamTM. The company rewards its employees for their ideas. “Their input is invaluable. We have up to a $10,000 award for ideas that can increase production and often reward year end bonuses for exceeding production schedules,” Pabla said. “We think that the level of customer service that we provide sets us apart. It is another key element to our success. Whenever a customer calls, they talk with a person. Our customers also have access to everyone in our company, even our president,” Pabla said. “Our sales staff is really more service oriented. They don’t have to sell. We often know what we will be producing six months in advance. Our biggest sales tools are the quality product we produce and our customers’ satisfaction,” Pabla continued. Brampton Brick sales staff works with the customer from the beginning of the project to the end. When a truckload of brick goes out, Brampton Brick sales staff goes with it. To maintain complete control over delivery time frames, Brampton Brick owns its own fleet of 38 trucks. Brampton Brick also allows site supervisors and project managers who are working with Brampton Brick on a job to hold weekly meetings at its facilities. In addition, Brampton Brick regularly hosts tours and seminars for masonry contractors, builders, and architects. Equipment improvements are an ongoing part of maintaining product quality, efficiency and optimum production. During the first part of 2003 Brampton Brick retrofitted two older kilns and increased throughput by approximately 10%. The company has three football field sized, energy-efficient kilns. During the last few years, three hammer mills increasingly made the production of a quality product a challenge. Problems with the crushers affected the entire system and caused downtime and increased production costs. Commenting on the hammer mills, Pabla said, “The hammer mills were high maintenance. Clay and shale gradations would vary from morning to night with the mills. We were constantly fighting for a quality product. Yet our customer always got the finest brick available, even though we had to fight for quality. We always maintained our high quality standards; it just required more manpower and cost to meet those standards,” Pabla said. Hammers on the mills wore quickly and affected material quality. Personnel would change the hammers and the product quality became more predictable. Then 10 hours later, the product specs from the hammer mill would change. Pabla said, “The material size was all over the place from morning to night. I was struggling all the time with the material. We had meters on the hammer mills. We would flip the hammers on the one mill, then on the next and then the next. Pabla added, “When the hammers wore out, then we had to put the material through again and again to get the size we wanted.” Maintenance was ongoing and continual. Brampton Brick had two employees permanently dedicated to working on the mills. One worked days, the other worked nights. Just changing the hammers took up to 30 hours a week. Brampton Brick works with Queenston shale, one of the most highly regarded shale for brick making in the world, as its main raw material. The company mines the shale from its own quarry locat!Inthedspringnear theand plantfall,the. shale i s wet. The hammer mills could not handle the wet material. Brampton transports the shale from the quarry where it is stockpiled outside to the plant where it is stockpiled under cover. The wet material plugged the hammer mill and caused huge problems. Personnel would have to unclog the mills manually, removing large clumps of material. Costs to keep the hammer mills up and running totaled $40,000 a month including hammers, maintenance, downtime and man-hours. Brampton ran the hammer mills 18 hours a day and obtained 80 TPH. Brown and Pabla said that the inefficient hammer mills led to a 3-5% downtime for the overall production. When Brown and Pabla began looking for equipment to replace the hammer mills, they had guidelines to follow. They wanted equipment that would give them the tonnage they wanted and needed now…and had the capacity for increased tonnage in the future for expansion. Photo, “Ziggy at Controls” Ziggy Pabla, Brampton Brick plant manager, is shown at the master control panel for the fully automated brick manufacturing operation. Every element of the brick making process can be monitored from this area. Before purchasing, Brampton Brick sent material to Stedman for testing. Stedman has a full-scale test lab that takes all of the guesswork out of which piece of reduction equipment will do the best job for the application. The full scale testing assures customers they can get the size reduction in the most cost-effective way. The test data also helps customers estimate operation costs, ranging from power usage to wear costs. Brampton Brick purchased its first piece of Stedman equipment, the Grand-SlamTM 4860 impact crusher, in February 1999. The Grand-SlamTM replaced two Verdes hammer mills that caused Brampton Brick so many headaches and were so expensive to operate. One hammer mill was removed completely. The other hammer mill was left in place to grind the covers returning from the screens. The Grand-SlamTM currently grinds about 110 TPH for Brampton (which is under capacity, actual capacity is up to 200 TPH). It delivers up to a 30:1 material reduction for more properly sized material on the first pass through. It has an open discharge that eliminates clogging or build-up of material exiting the crushing chamber. Photo, Overview of the materials handling conveyors and feeding screens in Brampton Brick’s size reduction area. The Stedman Grand- SlamTM 4860 impact crusher can be seen in the background. The Grand-SlamTM operates as a secondary crusher. During the initial reduction, breaker bars impel material against the primary apron. Then the reduced material passes through to the secondary apron for final size reduction. The aprons are adjustable to allow for precise gap adjustment. Rotating or replacing the breaker bars can be done quickly and easily, keeping downtime to a minimum and reducing labor costs. With the Stedman mill, Brampton Brick needs fewer material passes. The company was limited with the hammer mills. “We could only put so much through, about 50 T an hour. When the hammers wore out we had to put the material through again and again to get the size we wanted,” Pabla said. With the Grand-SlamTM, processing tonnages have increased. “Our throughput rose to 140 TPH and we started running the line 24 hours a day. We didn’t have any new equipment with the exception of the Grand-SlamTM. And the return on investment was only about a year,” Brown!“Withsaidthe. Stedman, there are no problems. Regardless of the material quality or wetness, the Stedman just keeps running and running the same tonnage hour after hour,” Pabla said. Pabla and Brown were not pleased with the hammer mill that was still in operation at the plant. In June 2003, they purchased another Stedman mill, a H-SeriesTM Cage Mill, to replace the hammer mill. Specifically designed for the clay and shale industry, the cage mill came equipped with heaters and air cannons to cope with wet sticky material. It receives the oversize material from a screen bank of seven screens. Two of the screens are at 8 mesh and five screens are at 14 mesh. The cage mill grinds the material and returns it back to the screens for classifying. “With the Cage Mill, if I want every single piece in powder, I can get it. We have lots of different types of shale, size and moisture content wise. Nothing goes through the second pass. Before, we were getting 70% product in one pass. With Stedman, we are getting 82% product in one pass…and we’re only running at 2/3 speed,” Pabla continued. Two months later, in the fall of 2003, Brampton Brick purchased a Stedman Mega-SlamTM. The Stedman Mega-SlamTM was installed at the quarry to replace a Verdes three roll crusher. The Verdes was completely worn out and needed major repair or replacement. The company decided to replace it. The Mega-SlamTM crusher produces many more fines than the roll crusher and that takes some of the load off the other two crushers. Brampton Brick installed a grizzly in front of the crusher allowing all the (-) 2” material to fall directly on the discharge conveyor and the (+) 2” to go to the crusher. The Mega-SlamTM is crushing material that is (-) 24” by (+) 2” at a rate of more than 200 TPH. With a capacity range from 250 to 300 TPH, it will deliver capacity for future expansion as needed. The Mega-SlamTM 4860 effectively handles feed sizes beyond the range of conventional primary crushers. It has a large feed opening, a solid rotor design, replaceable apron liners, and interchangeable sideliners to delivery the highest level of performance. It is designed for low maintenance and provides easy interior access to breaker bars, primary and secondary aprons and sideliners. The Mega-SlamTM breaks material down to (-) 3” pieces. The Grand-SlamTM can handle up to +10” pieces. The smaller the size Brampton Brick gets with the first pass, the lower its amperage and hydro costs. “This also means that we can increase our TPH. We need about 2300 ton of material per day (Monday through Friday) to operate. If we ½are”togetting1inch size we can double capacity,” Pabla said. Photo, Brampton Brick are shown at the end of the brick making process. Automated equipment prepares the brick for packaging and shipment to customers while an employee monitors the process. “We have the capability to grind more material than we need with the Stedman mills. We are putting about 2000 T a day through them. We can go to 3000 T a day. The extruder runs steady now. Whenever you have to stop and start machinery, it decreases its life. Now, the machinery runs all the time. We can also easily change particle size. Auger and liner life in the extruder has been extended. We used to spend 12-14 hours changing augers and liners on the old mills,” Pabla said. “The Grand-SlamTM and H-SeriesTM cage mill operate 24 hours per day. We are not using the Mega-SlamTM to its capacity. When we purchased the Mega-SlamTM, we bought it with the future in mind. It can give us what we require today and it can grow with us tomorrow. It is for future expansion,” Brown continued.